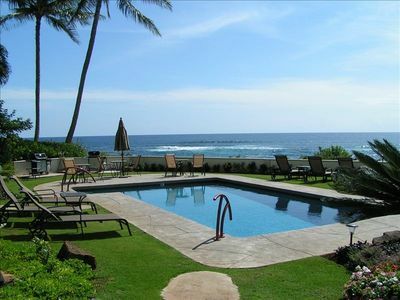 Our beach house is located in Kiahuna Plantation at Poipu Beach on the south shore of Kauai. 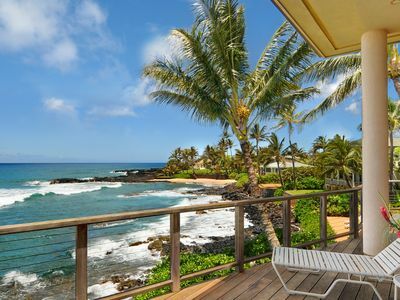 The southern part of the island is known for sunny days and great breezes and Kiahuna is considered the area’s premier beach-front rental property, the only one in Poipu with its own white sand beach. 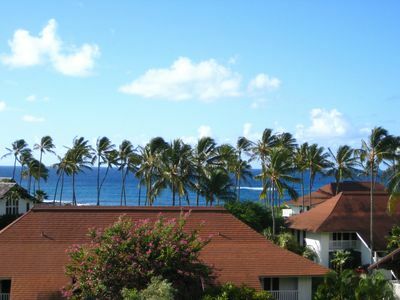 The condo's architecture is reminiscent of Hawaii's 19th-century plantation past and provides the classic Hawaiian setting for your stay on the island. 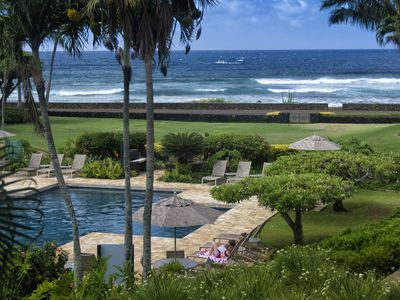 The buildings at Kiahuna are nestled in 35 acres of sprawling lawns, lush tropical gardens, lily ponds, a private lagoon and the largest orchid garden in Hawaii. Our condo #123 is on the top floor of Building 18, located between the ocean and the pool/fitness center. As you'll see in the photos, it was completely renovated using top of the line finishes including granite counters, travertine tile and bamboo flooring as well as all new appliances, cabinetry, lighting and furniture. The walls were removed between the kitchen and living room to create an open floor plan so you have unobstructed views of the ocean. All the rooms have louvered windows and doors which lets the breeze pass right through and there are ceiling fans in the bedroom and living area that also keep it cool and comfortable. As soon as you walk in the door you have a great view straight through the condo to the ocean. On the left is the bedroom with a king-size bed, TV, dressers and closet and on the right is the bathroom with a big walk-in shower and a separate vanity area. 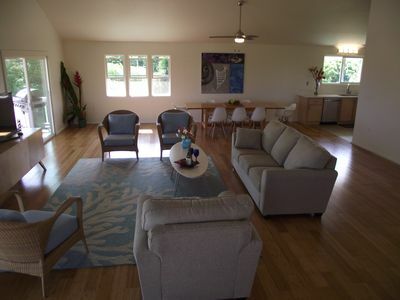 The living, dining and kitchen are in one large vaulted space that opens to the lanai. 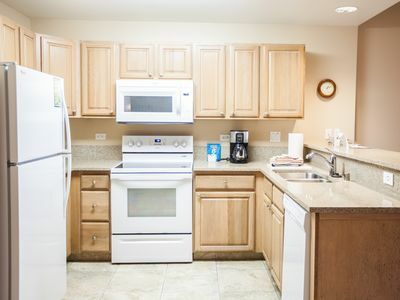 The kitchen is fully furnished and is great for preparing anything from fresh papaya for breakfast to fancy umbrella drinks and gourmet dinners. 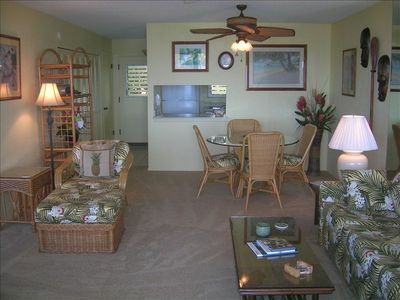 One of the best parts of the condo is the covered lanai that runs the whole width of the beach house. 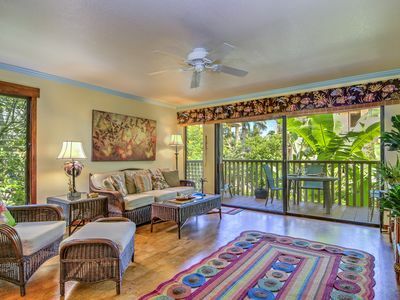 There are over 15 feet of glass doors and windows that open to the lanai from the living area. 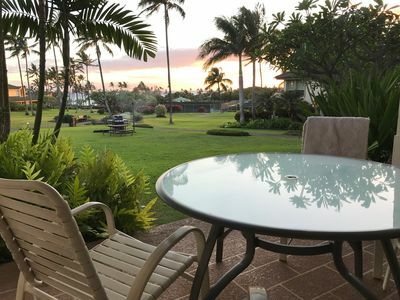 The lanai is furnished with a bar-height table and chairs so you have a wide, open view of the ocean and grounds. It also has two lounge chairs which are a perfect place to relax, read and listen to the surf. 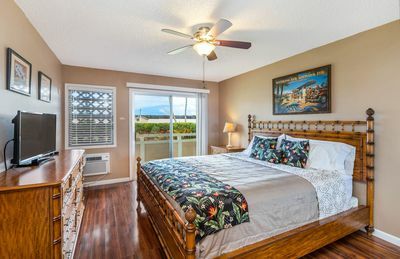 The advantage of staying in this unit is that the ceiling is vaulted to 14 feet high which makes the condo airy and open, and at night you can open the screen doors on the lanai to enjoy the ocean breezes while you sleep – something you can’t do in a ground floor unit. It’s also nice because you don’t have the noise of another unit above you so it feels like a private retreat. 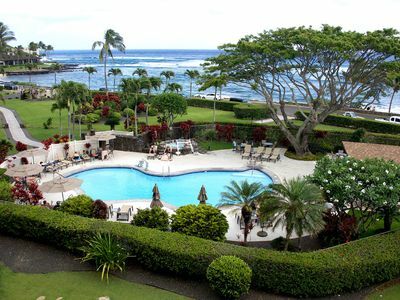 Kiahuna’s beach is a quick walk through the beautifully landscaped grounds. 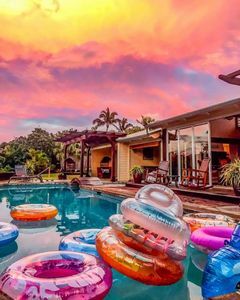 There is a manicured lawn dotted with palm trees fronting the beach and that is where you will find the Beach Hut where you can get complimentary beach chairs and towels. The Hut also offers snacks and rentals of various beach toys that you can charge to your room. The beach is fairly private and it is used mostly by people staying at Kiahuna. 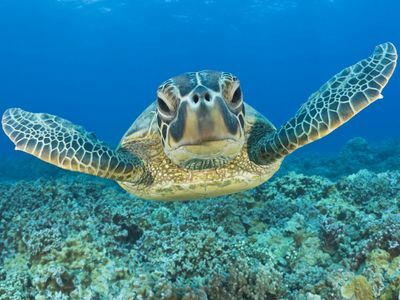 It connects to Poipu Beach which has more activity and good snorkeling. 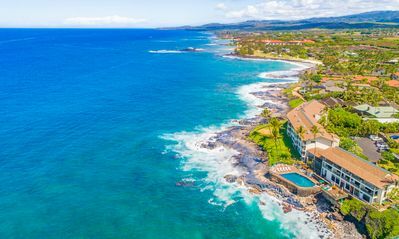 Poipu was rated #1 by The Travel Channel and has been chosen as one of the most beautiful beaches in America. We provide on-site management, staffed 24 hours a day. You check in like a hotel, and the friendly staff is always available to assist you in any way. 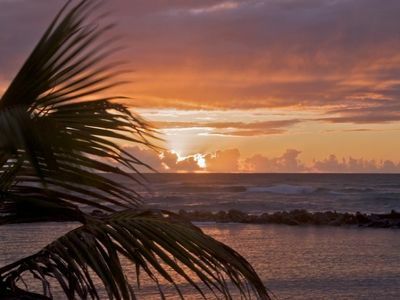 The concierge at the Activities Desk is a great resource to help with ideas, directions and reservations for anything from dinner to helicopter tours, sunset cruises, tee times (at one of many nearby golf courses), horseback rides or luaus. Guests have full complimentary access to the Poipu Beach Athletic Club (right across the street) with aerobic equipment, treadmills, ellipticals, bikes, weight training machines and free weights. There are a number of great restaurants nearby. 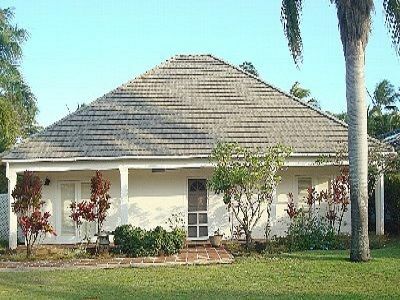 On the Kiahuna grounds is the historic plantation manager’s cottage built in 1930 that now houses the Plantation Gardens Restaurant and next door is Red Salt at the Koa Kea. Across the street is Poipu Village Shopping Center and down the street is Kukui'ula Village. 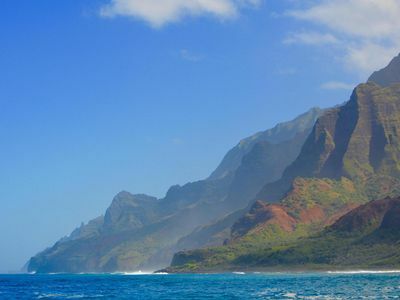 They both have restaurants and shops that offer everything you could possibly need for your time on Kauai. We love Kauai and we looked for a long time to find a place that we would want to return to year after year. #123 is that perfect place and we hope you consider it home too. Cleaning Fees are additional. Guests pay a Check-out cleaning fee ($165). A Mid-week cleaning ($80) is required for every 7 night stay. (Price may vary based on housekeeping's current rates). Cleaning fees will be collected by the front desk upon check in (they aren't collected by VRBO). 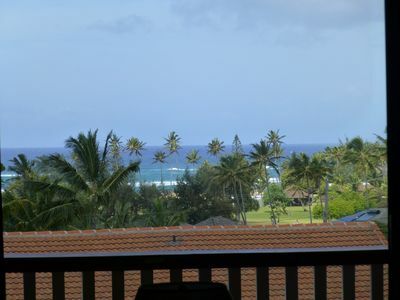 Deluxe Poipu Beach Oceanview -Park Next to Door! No Stairs! A/C! 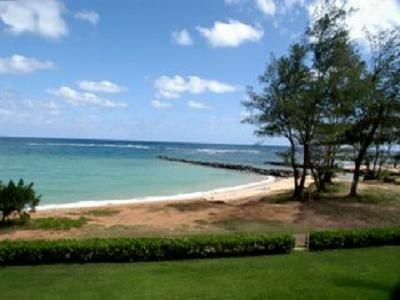 Lawai Beach Resort ~ 2B on Kauai's Sunny South Shore ~ Across from Snorkeling! 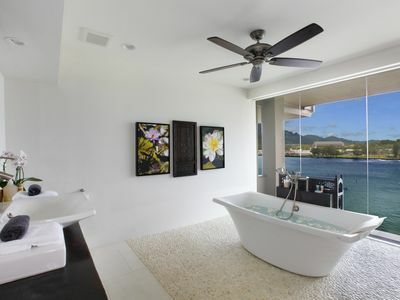 Beautiful 4 br for12 oceanfront villa offering breathtaking views!